How do you know what to wear skiing? 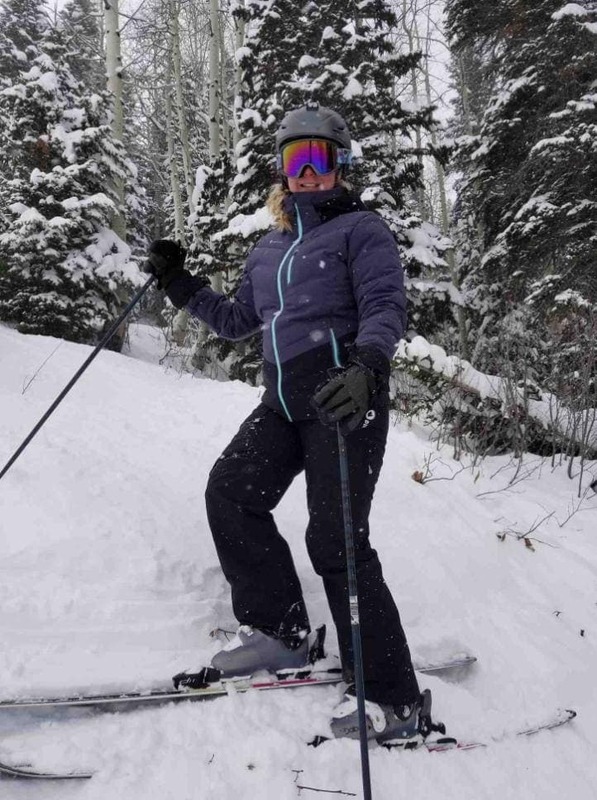 I learned to ski as a teenager in Indiana and remember piling on as many warm clothes as I could possibly put on my body. No wonder I couldn’t ski, I could barely move! As I learned to ski I also learned to choose the right layers for skiing. I mainly figured it out by trial and error years ago and by upgrading gear through birthday and Christmas gifts. Honestly, I didn’t really know what to wear or why until moving to Utah. It was easier to pick up on as I saw other skiers, visited ski shops and read blogs on suggested clothing. 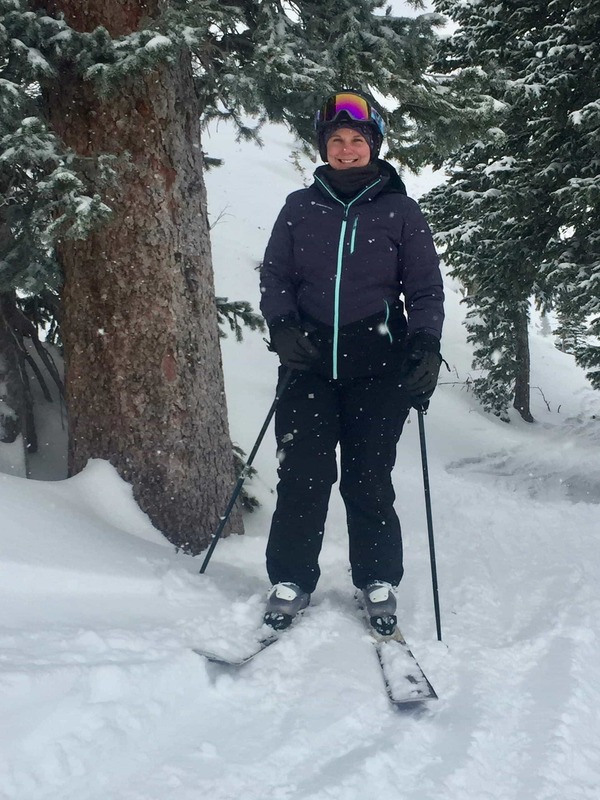 There are lots of choices and ski gear is expensive so you really do need to know what to look for before heading to the slopes or shopping. Here are two great posts from a favorite blog of mine, Bearfoot Theory, regarding clothing choices. What are the conditions you are skiing in? First, I will think about the conditions I will be skiing in. The obvious one; temperature, but also humidity, wind, rain or snow. The presence or lack of sunlight can play a huge difference in the “feels like” temperature. I use to have my “ski clothes” and that is just what I wore, but now I think more about what to wear based on these factors. Second, I will think about the terrain I am skiing. If it’s a deep powder day, I know I will be physically working much harder which will cause me to sweat more so I may choose less or lighter layers. If I think I’ll be skiing more groomed runs, I’ll choose my warmer layers thinking I won’t be physically working as much. Now, this is definitely what I know about myself and my ski habits. You will need to learn what works best for you depending on how you approach skiing. Third, I decide about take anything extra with me. For example, if it’s going to snow all day I may grab an extra neck warmer to replace mine at lunch. One of the things that makes me most uncomfortable is putting on a wet neck warmer after being inside at lunch. Another example, if it’s super cold I may grab some hand warmers to tuck into my coat just incase I need them throughout the day. Finding what works best for you will be a little bit of trial and error, but soon you will be able to better decide what to wear each ski day. This will make your day on the slopes so much more enjoyable, regardless of the conditions. Snowy conditions and still smiling! Dressed for the all day snow! Your clothes will probably fit into these basic layers; socks, baselayer pants, ski pants, baselayer shirt, mid-layer shirt, ski coat, ski gloves, neck warmer and hat. As I said, when I first started skiing I’d pile on clothes thinking that I needed to for warmth. This is not necessarily the case. Using this basic clothing list and making good choices in the layers should have you warm and comfortable all day long. Up until a few weeks ago, I had two pairs of ski socks. A basic pair of Smartwool ski socks that I bought many years ago, which are a bit thinner, fit tighter and this is what I prefer. The second pair is thicker and fits a bit looser. I mainly wear these when I know it’s going to be really cold. They really aren’t any warmer, but the little bit of extra thickness makes my feet fit better in my boots since your feet will “shrink” a bit when it’s super cold. The Smartwool socks are my go to and I planned to get another pair this year. It would be easy to order online, but I wanted to see them in person to ensure they were the same as the pair I have. I hadn’t gotten around to buying a pair when I entered an online giveaway and ended up “winning”a pair of Smartwool Women’s PhD Pro Free Ski Socks! I was thrilled! Let me tell you, they are fantastic! Just like my old pair, but even better. The PhD Pro socks are the same thin socks I was looking for, but also have added just a slight bit of padding in the right places; shin, heel and toe. These are super comfortable and the only pair I’ve worn since getting them! I wear base layer under my ski pants. Again, I have a few different pairs with varying thickness. I have two thin pairs of the 32 Degrees Heat Ladies Baselayer Pant that I picked up at Costco this year and these are my new favorites! Soft, comfortable and so reasonably priced. They were a sale item in November and nearly sold our in our local Costso by mid-December. Fantastic price point of seven bucks! They are just what I need for early and late season to have a layer between skin and ski pants. 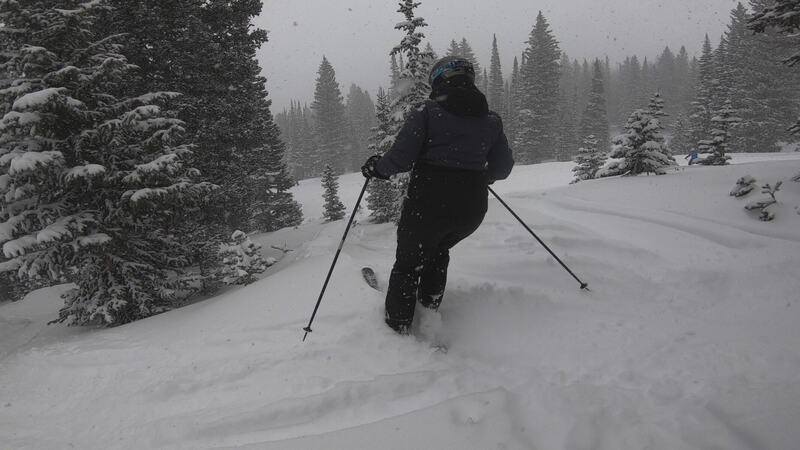 I also really like the Terramar base layer pants that I bought last year at a local ski shop. These are just a bit thicker and therefore have more coverage, especially if you wear them alone in the lodge! I’d say they are a tad bit warmer than the 32 degrees pairs, but I haven’t even worn this pant yet this year. Finally, I have a pair of the Cuddl Duds Stretch Fleece Leggings. These are super comfy and warm. If it’s going to be really cold and windy, I’d choose these for the day. These are quite a bit thicker (fleece) and make a good option for wearing alone since they are a more full coverage base layer. This is especially nice if you are planning to stop for food or something on the way home. Well, I’ve had the same pair of North Face ski pants for years… and years! I’m embarrassed to admit this, but I’m pretty sure they are about 14 years old! I tried on a few pairs this year because I really should get new and thought I would when I got a new coat. However, I didn’t find any that I liked better, so why bother? I have to think that the weatherproofing and warmth have been compromised because of age, but I haven’t had any issues so I’ll keep wearing these until I decide that new is better. I love my Cuddl Duds Software Stretch Crew Neck Shirts, they are moisture wicking and comfortable. They aren’t too thick, but thick enough that they can be worn alone. When it comes to base layer shirts, the fit is it for me. If they are too tight, they get itchy; too loose and they don’t do their job. I worn these for years and will continue to until they fall apart. Like everything else, you might need to find what works for you through trial and error. I’ve tried the turtle necks versions and hated it, but love my mid layer to have the turtle neck. Go figure! I’ve bought a couple of the more expensive shirts years ago thinking I needed a good name brand base layer only to find out the type/fit wasn’t for me. As with other layers, you may want to try a cheaper options if you aren’t sure. You can always upgrade later as to not waste money upfront. This is the layer that changes for me most often. I have three types of shirts I will wear depending on the temperature. The first would be in warmer conditions, I may just wear a t-shirt or just omit the mid-layer altogether. The next option is what I wear 90% of the time and that is an old Columbia light sweatshirt. I actually have two of these and wear them ALL. THE. TIME. Even when I was teaching, I wore these to school… if you haven’t picked up on this yet – when I find something I like I wear it everywhere and for everything. My third choice is a Tek Gear Fleece Lined Sweatshirt that I picked up at Kohls last winter. These are a bit warmer and the fleece is nice and comfy on a cold day. Again, I wear these at home all the time and they are super cheap. I got a new ski coat this year and like my ski pants, my previous coat was over 10 years old! I chose the Obermeyer Cosima Down Jacket because it’s made with a stretchy liner and is down lined through the back and front. It’s also seam-sealed, has underarm vents, good pockets, a powder skirt and detachable hood. With ski coats, there are two main routes. You can buy as I did and get something that is lined for warmth or you can buy a shell and liner (these can be bought together or as stand alone coats that are worn together). I thought I’d choose the shell and liner for versatility, but once I tried on the Obermeyer, it just felt right. I’m anxious to see how I feel about it in the spring because it might end up being too warm. For that reason, I do still have my old coat which is similar to this North Face TriClimate Coat. This type of coat has a shell and liner that zips together. I may end up wearing only the liner for spring skiing or I may even grab an end of season deal on a new liner. We will have to see what I need. I’ve had off-brand gloves, North Face gloves and am currently wearing a pair of Dakines ski gloves. 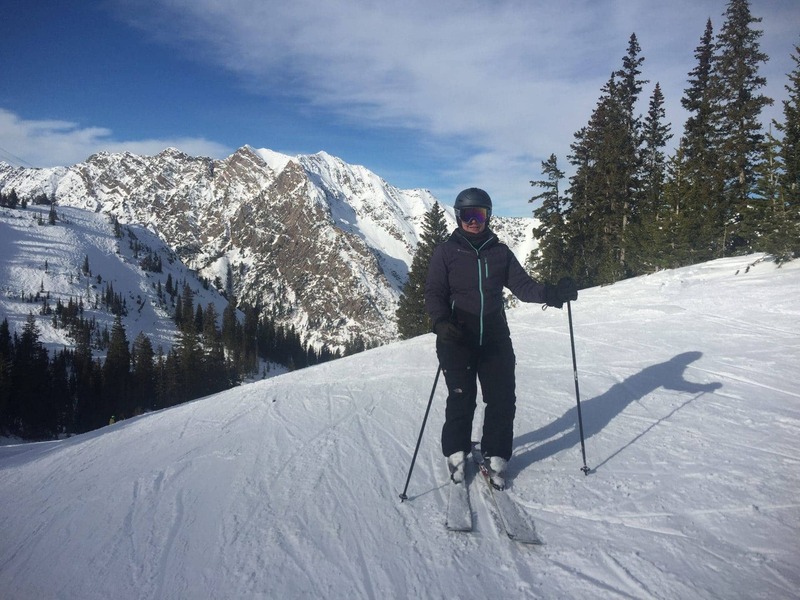 My experience has been that as long as they are a decent pair of ski gloves and made for outdoor sports (warm and waterproof) I choose whatever feels most comfortable. I have a pair of North Face that I really like, but they are a little small and start to feel tight if I’m sweating and don’t allow for liners. My current gloves, the Dakines, fit higher on my wrist and I didn’t realize the extra warmth this can provide. Many like to wear liners for the extra warmth, especially since you may find yourself removing your gloves often; adjusting boots, snapping a pic, blowing your nose, eating candy, etc. I do not prefer liners, but always have them with me in case I need them. The other feature that is now a must for me are the “leashes” that my Dakines have. These are just convenient so you don’t lose them. It’s also nice to be able to hang your gloves in the restroom on the hook. My favorite neck warmer is the Smartwool Merino Neck Gaiter because it is thin and moisture wicking. I wear this 90% of ski days and most of the time I pair it with a Columbia Neck Gaiter. I like the Smartwool gaiter on my face since it’s very thin and breathable. The Columbia gaiter is just an extra layer of warmth and protection from the wind, especially filling in the gap around the neck of my coat. If it’s super cold or snowing a lot, I’ll wear this Seirus Ultra Clava because it protects your entire face; from the cold air, wet snow and/or wind. This is quite warm and allows for very little to no exposure to the elements while skiing. The prAna fleece lined hat I’m wearing now was on a summer sale rack that I happened to pick up because it’s a name brand, lined, was only a few dollars and I liked the pattern. Simple as that. I do always wear a helmet so something basic works best for me. Make choices that are moisture wicking and comfortable. Any sports bra should work well and there are plenty of cheap options at Walmart and Target for moisture wicking or cooling underwear. How do you choose your skiing clothes? Is this similar to what you wear for skiing? How do you choose your ski clothes? Do you have any recommendation on your favorite clothes? Look at all that fresh snow!